Question: What marvelous community-based voluntary health measure has done the most to prevent tooth decay in the U.S. in the past 70 years? Fluoride is a tooth’s best friend because it strengthens the enamel and can reverse demineralization. That’s why there is fluoride in toothpaste and fluoride treatments are performed during routine teeth cleanings at Expressions Dental Care and other dental practices across the country. Most water that comes from natural sources contains fluoride along with many other critical minerals. In 1945, Grand Rapids, Michigan became the first city to adjust the fluoride level in its municipal water supply to improve the dental health of its citizens. Since then, hundreds of U.S. communities have voluntarily adjusted the fluoride in their water supplies to recommended levels, delivering beneficial dental benefits to millions of Americans. 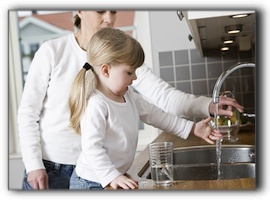 How do you know if your municipal water supply is adjusted for the optimum fluoride level? Check your water bill for the phone number of your local water district and call their office. They can give you information on the levels of all the minerals in your water and whether the fluoride levels are adjusted to recommended levels for dental health. Families with wells can have their water tested at a laboratory. Contact your local health department for specifics on where to get your water tested. If you have children and your municipal water supply does not contain the recommended level of fluoride, you may want to give your kids fluoride supplements. The fluoride will strengthen the primary teeth that have already erupted and also the adult teeth that are forming. Your Reston pediatrician or family doctor can prescribe fluoride supplements. If your child hasn’t had a dental exam in a while, call Expressions Dental Care at 703-757-6453 to schedule a pediatric dental exam. We are dedicated to ensuring that our youngest patients feel safe and comfortable. Expressions Dental Care is located at 11515 Sunrise Valley Dr in Reston. We serve the Reston, Herndon, Vienna, and Sterling communities with extraordinary dental care. We offer a full range of general and cosmetic dental procedures. Ask us about family dentistry, sleep apnea/snoring treatment, cosmetic dentistry and dental implants.